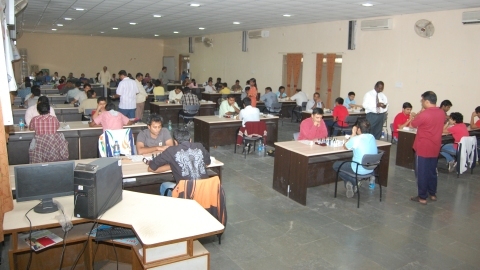 With four rounds to go, the fight intensified on top boards of the 49th National Premier Chess Championship, organised by Marathwada Chess Association at MIT, Aurangabad today. Abhijeet Gupta of PSPB kept his half a point lead with 7 points in the ninth round. IM Shyam Nikhil of Tamil Nadu joined grandmasters GN Gopal of PSPB and Deepan Chakravarhty of TN on the second spot with 6.5 points. The feature of today’s round is Shyam Nikhil’s second GM norm, having made his first norm in Mayor’s Cup, Mumbai last month. 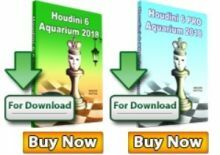 In the Dutch variation of the Slav defence played by GM Tejas Bakre of Indian Airlines, Abhijeet Gupta could not get any breakthrough, after exchanging the queens on 19th move. In the bishop vs knight ending, Abhijeet had to give up his bishop to stop Bakre’s a2 pawn from being promoted. They signed the peace treaty after eighty moves. On the second board, GN Gopal of PSPB and Deepan Chakravarthy of Tamil Nadu kept their chances alive by agreeing to split the point in a rook and pawns ending of a French defence game. Former under 17 national champion P. Shyam Nikhil from Kanyakumari, the south most point in India held his nerves to beat former under 12 world champion Deep Sengupta of West Bengal to earn a hard fought second 9 game GM norm. After exchanging the queens on 30th move, Shyam took control of the open c- and d- files to gain momentum. When faced with loss of material, Deep resigned on 41st move. Former under 16 world champion SP Sethuraman of Tamil Nadu recovered his position in the championship by disposing IM Karthikeyan from the same state. Sethu sacrificed his knight on 20th move to get space advantage. Ten moves later, he exchanged the queens leaving his rook to rule the roost. Karthikeyan resigned on 41st move. GM Abhijit Kunte of PSPB played an attacking game against his team mate MR Venkatesh in a Catalan opening. He grabbed two pawns in the early part of the game and Venakatesh was forced to part with his rook for the promoted pawn. Kunte had a convincing win in 64 moves. Defending champion Parimarjan Negi of PSPB is back into contention with a hat trick of wins. His victim in this round was Swapnil Dhopade, an IM from Railways. Negi offered his bishop for a pawn, which was not accepted by Swapnil. Later, the very same bishop combined with his queen to master the situation to fetch a point to Negi. 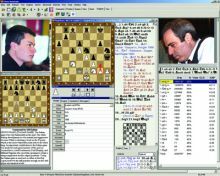 In a Kings Indian game, both Vidit Santosh Gujrati of Maharashtra and Ratnakaran of Railways had equal pieces in the middle game, Vidit’s two rooks and the knight were very active, compared to Ratnakaran’s dormant knight. 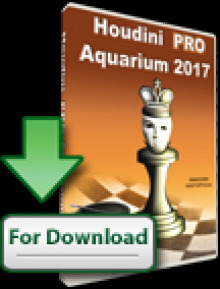 Vidit’s queen also joined the assault at g2, forcing Ratnakaran to resign in 34 moves. Asian Junior champion M. Shyam Sundar of TN ended the good run of WGM Padmini Rout of Orissa. Padmini was forced to give up the exchange in order to prevent Shyam’s marching d- pawn. Shyam finished off in 55 moves. Though PSPB’s GM Arun Prasad was exchange down, his extra pawn helped him to pocket a point against national junior champion MR Lalith Babu of PSPB. 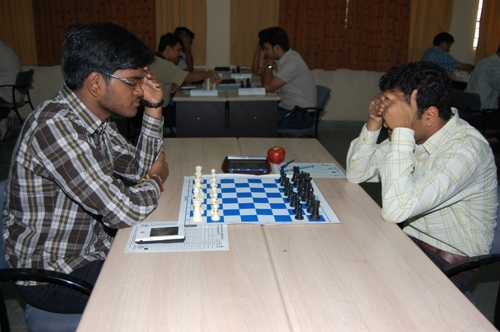 Shyam Nikhil (left) secured his second GM norm. 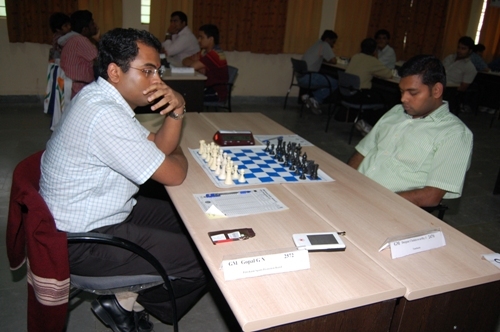 His opponent was GM Deep Sengupta. Debutant fifteen year old G. Akash from Chennai displayed his maturity yet again, against Railway’s IM Vikramaditya Kulkarni by sacrificing his knight on 21st move. Four moves later, Akash got back the piece by a series of exchanges, providing space advantage to Akash.